Summer is right around the corner and it’s time to take the party outside! 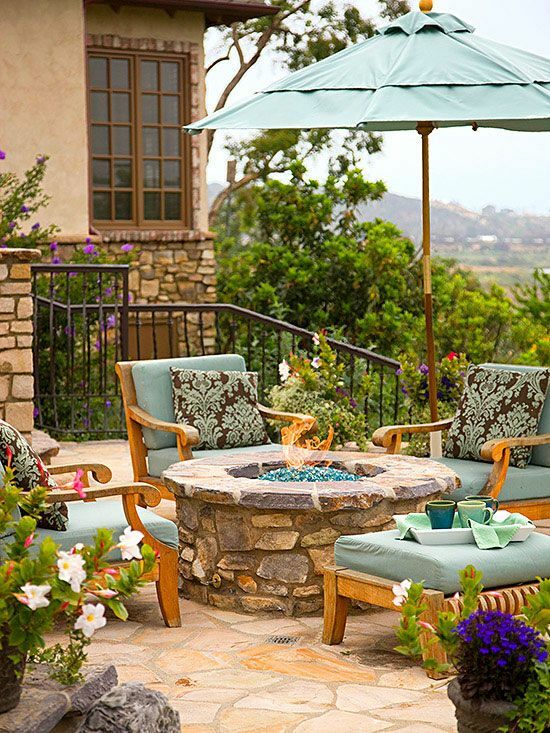 Outdoor fire pits provide a perfect environment to mingle with friends and enjoy the summer! What’s better than sitting outside on a nice summer’s night around a firepit? 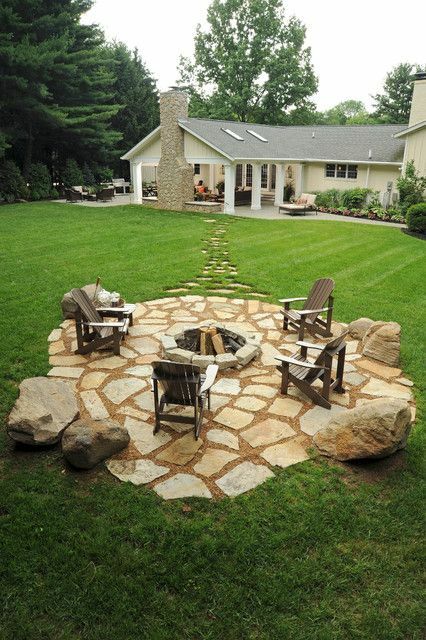 A well-designed fire pit can make a backyard look elegant and inviting! Get ready to spice up your summer with a couple of these ideas for your very own inspiration. 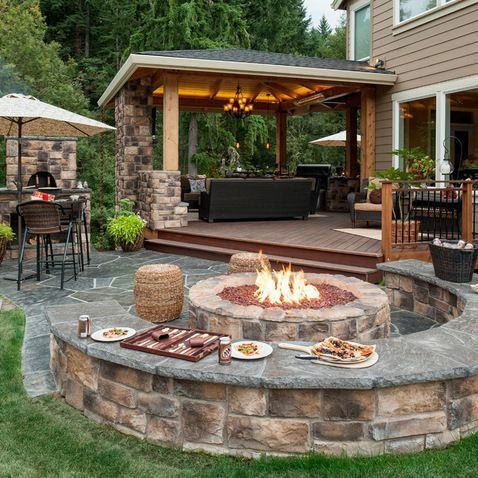 We love these great designs, and they are relatively easy to add to your own backyard! Everyone who walks in this house says WOW! California living at its best with this custom designed open floorplan offering an indoor/outdoor living experience. From the moment you enter the private gates, you see exquisite architectural details and spectacular views. Full walls of glass doors opening to incredible back country views. 5 bedrooms with en-suite baths, over sized mst. retreat w/ endless views, chefs kitchen and hardwood floors throughout. All on a 1/2 acre. You won’t be disappointed! Sold for $2,575,000! Turn-key, exquisite single level estate home! Located within the exclusive gate guarded Fairbanks Highlands Estates. Large useable yard with waterfall, pool & spa, lanai with fireplace, outdoor kitchen, BBQ, and much more. A must see! BTVSQFTB4 and info before COE. SOLD for $2,390,000. West of the FWY, a Beautiful, Brand New 4 Bedroom ( one being a guest suite with a deck) & 5 Bath Family Home on a Large Cul-de-sac Lot in the Exclusive Community of Eolus 4! Designer selected finishes throughout with Indoor/Outdoor Living including a Chef’s Gourmet Kitchen, Huge Laundry Room,Voluminous Ceilings, Spacious Rooms/w tons of Natural Light, Game Room, Downstairs Master Suite and a separate private office off the entry, Fireplace in the Family Room, 3 Car Garage . This is a must see! SOLD for $1,975,000. SPECTACULAR FAIRBANKS HIGHLANDS PLAN 2 ESTATE. ELEGANT SPANISH STYLE SINGLE LEVEL ESTATE WITHIN COVETED GUARD GATED COMMUNITY. 4 BEDROOMS ALL EN SUITE PLUS OFFICE, FORMAL LIVING/DINING ROOM, WONDERFUL KITCHEN/FAMILY ROOM WITH LARGE DINE IN AREA, 3 CAR GARAGE, SEVERAL UPGRADES INCLUDE GRANITE COUNTERS, STAINLESS STEEL APPLIANCES AND A LUXURIOUS MASTER SUITE. VIEWS TOWARD OPEN SPACE. ALL THIS PLUS 1+ ACRE W/ ROOM FOR A POOL! EXCELLENT VALUE FOR THE AREA. A MUST SEE! SOLD for $1,770,000. The GEM of LA COSTA OAKS! Breathtaking SHOWPIECE on premiere, elevated lot with OCEAN VIEWS! This stately home has been immaculately cared for and beautifully upgraded! Dramatic entry w/soaring ceilings, wide open floor plan w/oversized family room, gourmet kitchen w/huge island, full bdrm suite on first floor & loft area upstairs! Lavish master bath w/marble, Grohe steam shower & master balcony to watch peaceful sunsets! Entertainers bkyrd w/salt water pool, jacuzzi, built in BBQ & much more! SOLD for $1,555,000. ABSOLUTE PERFECTION in desirable LA COSTA GREENS! Situated on an elevated, pool size lot w/OCEAN, GOLF COURSE & CANYON VIEWS, this showplace is sure to impress! Gorgeous hardwood flooring throughout, crown molding, custom woodwork, built ins & 2 fireplaces just to name a few of the exquisite upgrades in this model like home! The chef’s kitchen features newer cabinets, beautiful stone countertops, SS appliances, butlers area & wine refrig. 1 full bdrm suite on first floor, huge loft up! See supplement. SOLD for $1,550,000. Amazing view with over 9,100 sqf lot in highly sought after gated Santa Barbara community! Bright, airy, and quiet! Gorgeous hardwood floor with accent carpet. Elegant wall wainscoting and wide crown molding. Wine cellar. Spacious kitchen with gigantic island and plenty of cabinets. New designer paint, upgraded new carpet. Remodeled master bathroom. 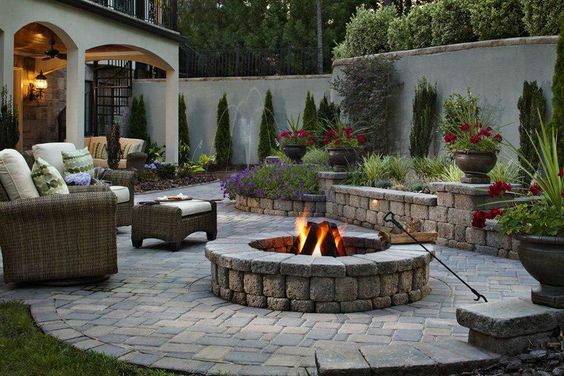 Beautiful courtyard with outdoor fireplace and water fountain. Huge backyard is waiting your swimming pool with breathtaking canyon view! Ask about schools! SOLD for $1,502,500. Property sold off market. Input as a courtesy to appraisers and agents. SOLD for $1,400,000. NEW CONSTRUCTION est. Spring 2017 Move-In! Toll Brothers luxury in coastal Carlsbad in this LA VERDE SPANISH COLONIAL home. Indoor/outdoor living at it’s best! Corner home site on cul-de-sac street. Great Room w/16’x8′ multi-panel stacking doors and f/p! Gourmet kitchen w/large island, upgraded white painted maple cabinetry to 10ft ceiling height & decorative hood, extended lower cabinetry with lots of storage, and ss appliances. Upgraded lighting and low voltage package! Pick your flooring/counters! SOLD for $1,282,131. Gorgeous 4 Bedroom Home on over 1/4 acre! Beautifully upgraded, remodeled and maintained. Custom tiled bathrooms, wood floors, surround sound, security system, master suite with vaulted ceiling and private balcony. Dream size yard with brick patio for year round entertaining and huge yard, perfect for kids, sports, pets or add your own pool. Fully finished oversized garage with large storage attic. You will fall in love with this home! SOLD for $1,260,000. Enjoy the spectacular sunsets with sweeping mountain views from this meticulously upgraded Torrey Glenn home. Open flowing floorplan with custom fireplaces, gourmet kitchen with granite counters, large family room with French doors to a lushly landscaped yard make this an entertainer’s delight! 1st floor guest wing: bedroom, bath & garage. Master suite with private balcony, spa-like bathroom with marble, granite, jetted tub & luxe shower. Seller willing to entertain offers between $1,100,000 & $1,174,333. SOLD for $1,170,000. Beautiful single level home in The Lakes. An open floorplan bathed in natural light. Spacious backyd w/tranquil fountain, flowering shrubs & trees & serene view. Liv rm w/fireplace & wall of glass doors that tuck away & open to patio dining blending an indoor/outdoor atmosphere. Lg gourmet kit w/center island, gas cooktop, SS appliances & classic white cabinetry. Luxurious master suite w/walk-in closet w/built-ins, & relaxing spa like ensuite bath. 4th BR is guest suite w/liv rm, ensuite BA, mini fridge. SOLD for $1,150,000. Exceptional La Costa Oaks home featuring 4 Bd/3 Baths w/designer upgrades throughout, including wood flooring, premium carpet, upgraded kitchen cabinets, custom built-ins, granite gourmet kitchen, S/S appliances, plantation shutters throughout & more! Private outdoor living space w/gorgeous garden patio/courtyard area, lush landscaping, firepit & more! 3 car garage w/epoxy flooring, custom built-in storage & whole house water system! La Costa Oaks community amenities include pool/spa & fitness center. SOLD for $1,069,000. Experience the best of 4S Ranch! Recent upgrades, mountain views & a phenomenal floor plan. A highly desirable 1st floor room & full bath is ideal for an office or guest/senior bedroom. Entertainer’s dream kitchen: granite, upgraded stainless appliances & prep island. Fantastic mtn views from the luxurious master & 2 add. bedrooms. Private backyard with a lawn & pergola covered patio! Upscale, family friendly 4S Ranch offers top schools, parks, convenient shopping, restaurants and amenities. SOLD for $995,000. Rare updated canyon view home on pool-size lot! Unobstructed panoramic views! Pristine condition and move in ready. Large open great room features spacious kitchen w granite counters, tumbled stone back splash & extended family room w fireplace for entertaining. Optional 5th bedroom could be added as there is a full bath downstairs. Newer high efficiency HVAC, new carpet and light & bright w lots of dual pane windows. Top PUSD schools. Close to parks and schools. No HOA & low Mello Roos soon to expire! SOLD for $980,000. Charming Craftsman style home with rear entry 3 car tandem garage is immaculate and move-in ready! Ideal for busy families with a very low maintenance yard and many energy saving features. Light & bright kitchen with upgraded SS appliances, gorgeous white cabinets, & an expansive granite breakfast island. 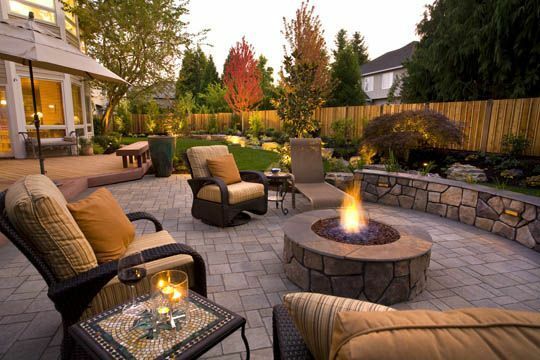 Cozy center courtyard complete with fireplace and BBQ island is perfect for entertaining. Private casita features a downstairs bed/bath. Top PUSD, close to parks, schools, restaurants in 4S Towne Center. SOLD for $960,000. Built in 2008, this home truly shows like a model… and features all of the benefits of a newer home…. yet has NO Mello Roos. With the addition of a 16 panel SunPower solar electric system, and drought resistant landscaping, your maintenance costs are minimized as well. Large corner lot features a wonderful courtyard area great for entertaining. Low annual fee is for use of the nearby Westwood Community Center. Come see… and understand the true meaning of “More Bang for your Buck.”see Supplement. SOLD for $935,000. Regent’s Square at its best! Highly desirable 2 story featuring 3brms plus den/office on main floor, 12 ft.ceilings, designer upgrades through-out with recessed lighting, wrought iron staircase, wide plank hardwood floors downstairs & master brm, lovely kitchen w/stainless steel appliances, granite counters & large pantry. Spacious master w/lavish bath & walk-in closet. Tranquil patio is surrounded by lush greenery & wonderful privacy, 2 car garage wi/epoxy flooring, storage & much more! See supplement. SOLD for $928,000. Experience model living & versatile spaces in this incredible Prado residence! The inspiring chef’s kitchen leads effortlessly into the Great Room, ideal for gatherings large & small. Entertain in style thanks to a rare private courtyard surrounded by flowering plants & fruit trees. The luxurious master suite & additional bedrooms are all spacious & bright. First floor bedroom & full bath. Enjoy upscale Del Sur living, offering community parks, pools, events, trails, top schools, shopping & dining! SOLD for $910,000. Move-in Ready RARE SINGLE STORY Detached Home.Fully Remodeled home Master-bedroom vaulted ceiling,side-by-side closets built-in organizers.Show stopping En-suite bath granite counter-top, custom cabinets & walk-in shower. Living areas Floors feature Natural Bamboo Wood.New Anderson windows.Kitchen showcases Real maple cabinets, granite counter-tops,stainless steel Thermador & Dacor appliances.New Carrier HVAC system.Near Torrey Pines High School & Canyon Crest. Close to Grocery Shopping,Restaurants & Parks. SOLD for $870,000. Seller looking for a quick close. GREAT LOCATION. Gated community. Single Story. Easy access to 56 freeway and I 5. Close to shopping, theatre, schools, and beach. Common Area, Park, Tennis, Trails. Del Mar Schools. Palacio Del Mar Golf Course and Many More Features. Double Entry Doors,Vaulted Ceilings, Wood Floor’s, Gas Fireplace in Family Room, WOOD SHUTTER’S THROUGH OUT HOME. Master Bedroom large two person Roman Tub, Walk in Closet in master, extra closet in master bedroom. SOLD for $850,000. Beautifully situated on a Large pool size lot including family fun pool table & hot tub! Upgrades throughout; include plantation shutters, beautiful wood floors & stairs, Travertine tile. Grand Kitchen with large center island, granite counters, full backslash,GE Monogram S/S appliances. Light & bright formal dining room looking into the entertaining courtyard. Whole house soft water system, Surround sound throughout , In -house security system, Built-in entertainment center, Epoxy Garage,(1 bed/ba down). SOLD for $816,000. LOVELY TOWNHOME ON THE GOLF COURSE WITH FABULOUS VIEWS. 3 BEDROOM, 2 1/2 BATHROOMS, FIREPLACE AND A 2 CAR GARAGE. WALK TO THE CLUBHOUSE, TENNIS COURTS, POOL, RESTURANTS AND SHOPPING. CLOSE TO THE BEACH. GREAT UPDATE POTENTIAL. SOLD for $815,000. Resort Style Living in this beautiful single story home located on the golf course in the highly sought after community of Lake San Marcos. Enjoy serene golf course views from the open floorplan offering spacious rooms, brand new roof & brand new carpet/paint throughout. Large chef’s kitchen boasts center island, Corian counters, & ample storage. The community offers 18-hole golf course, pools, tennis courts, award winning resort, restaurants, shopping, & more. VERY LOW Community fees and NO MELLO ROOS. SOLD for $776,650. Beautiful home situated on a HUGE lot in highly coveted La Costa. Walking distance to the new La Costa Towne Center and within a few miles of the beach, making this the perfect place to call home. Bright & airy family room featuring vaulted ceilings, wood beams & gas burning fireplace. Brand new kitchen featuring white wood cabinetry, granite countertops, mosaic tile back splash & tile floors. Gorgeous Backyard with extra large patio & pool/spa. A must see! SOLD for $775,000.